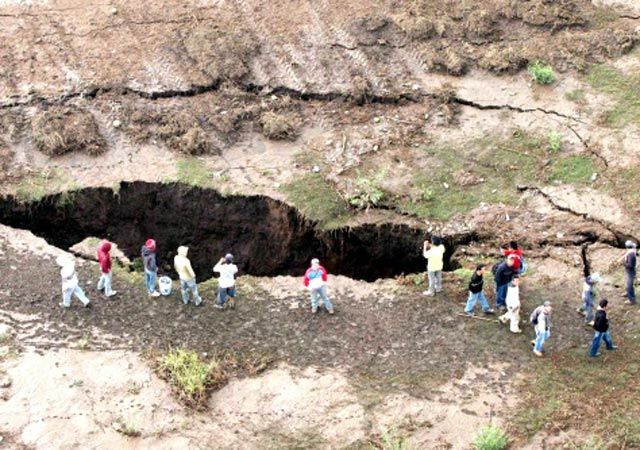 Excelsior was reporting about the crack which appeared on 13 July in Santa Maria Huejoculco in Chalco, State Mexico. The earthcrack has now reached 1500 meters long. Just after survey work was detected in Santa Maria Huejoculco yet another gap of about four km which reaches La Candelaria Tlapala, was found in the community of Miraflores, in Chalco. This event began back 2009 in a small area of this region but since that time, it has grown and opened to devour everything around it. The continued sinking of some parts of Mexico City in response to the over-extraction of water from underground aquifers, and consequent shrinking of the subsoil, has resulted in dozens of cracks in recent years. According to Gabriel Auvinet Guichard, a researcher at the Engineering Institute of the National University (UUNAM), cracks are becoming increasingly frequent. 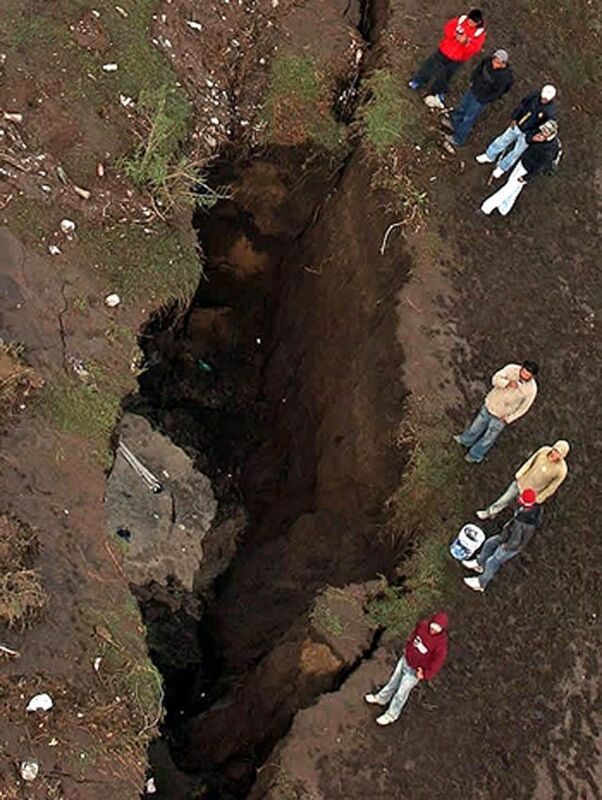 The largest cracks are up to 22 meters (72 feet) deep and 30 meters long. The cracks damage buildings and infrastructure (especially roads and water pipes), and have alarmed residents in some areas in the city. Auvinet’s team at UNAM’s Geoinformatics Laboratory is compiling a database of all known cracks. They plan to produce maps showing the incidence, location and origin of the cracks to help construction companies meet building regulations. The database has records of 380 fissures at present, but is still far from complete. In April, more than 200 homes in the low-income settlement of Valle de Chalco on the south-eastern edge of Mexico City, in the State of México, were flooded by raw sewage. 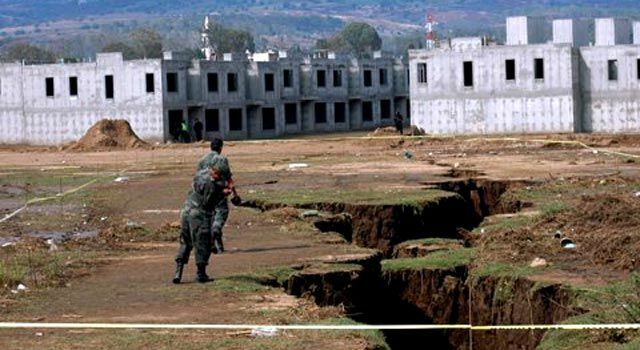 The affected homes were in San Isidro and La Providencia, in Valle de Chalco. (map) The problem was caused by a 30-meter-long crack in a surface sewage canal known as the Canal de la Compañia. The crack allowed 6,000 cubic meters a second of raw sewage to inundate nearby streets and homes. The federal water authority, Conagua, said that it would take three weeks to complete repairs to the canal wall. 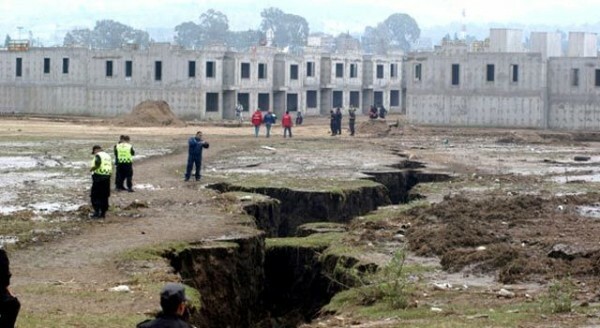 Restricted parts of the Valley of Mexico have been plagued by swarms of small earthquakes during recent years. The cause of these events is puzzling, but they may relate to massive artificial changes in the hydrology of the lake-bed which underlies most of Mexico City. Mexico City was built originally (ca. 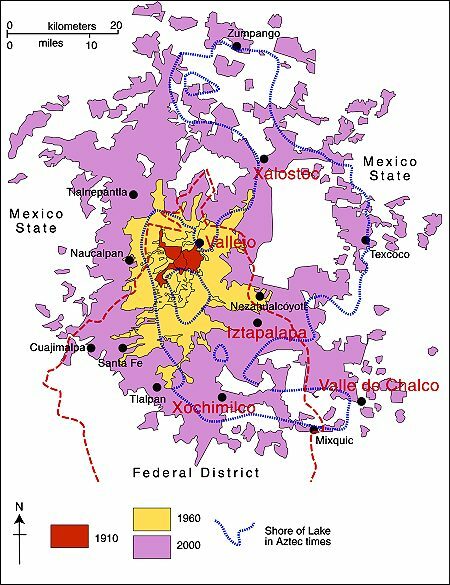 1325) on an island in the middle of a lake, and eventually became the capital of the powerful Aztec Empire. The provision of potable water is a problem that has plagued the city for centuries. Deforestation in the 19th century depleted the springs that had supplied the city with fresh water via aqueducts (some dating from precolonial times). The first fresh water well was built in the city center in 1857. By 1900 there were hundreds of wells sucking water from the underground aquifer. As more and more water was sucked up through the wells, the city began to sink. Some parts have dropped more than seven meters (23 ft) since 1891. Parts of the city center sank more than a meter between 1948 and 1951, and another meter by 1960. The city sank two meters below what remained of Lake Texcoco, posing a serious risk of flooding during the rainy season. In response, engineers sank wells into Lake Texcoco, sucked water from the aquifer, and the lake level dropped below the height of the city center. Rates of subsidence are very uneven. In places the weight of large buildings has caused them to sink into the dried out mud. The city’s magnificent Opera House (Palacio de Bellas Artes,) sank so far that its original ground floor is now a subterranean basement. To slow down the rate of sinking in the city center, in 1950 new wells were drilled south of the city reducing central city sinking to its current rate of about 10 cm (4 in) a year. Of course, areas in the south started sinking more rapidly. Lake Texcoco was a natural lake formation within the Valley of Mexico. The Aztecs built the city of Tenochtitlan on an island in the lake. The Spaniards built Mexico City over Tenochtitlan. Efforts to control flooding led to most of the lake being drained, leaving a much smaller Lake Texcoco west of the city, surrounded by salt marsh. The Valley of Mexico is a basin with an average elevation of 2,236 metres (7,336 ft) above mean sea level, located in the southern highlands of Mexico's central altiplano. It formerly extended over a large portion in the southern half of the basin, where it was the largest of an interconnected chain of five major and several smaller lakes (the other main lakes being Xaltocan, Zumpango, Chalco and Xochimilco lakes). During periods of high water levels—typically after the May-to-October rainy seasons—the lakes were often joined as one body of water, at an average elevation of 2,242 metres (7,356 ft) above mean sea level. In the drier winter months the lake system tended to separate into individual bodies of water, a flow that was mitigated by the construction of dikes and causeways in the Late Postclassic period of Mesoamerican chronology. 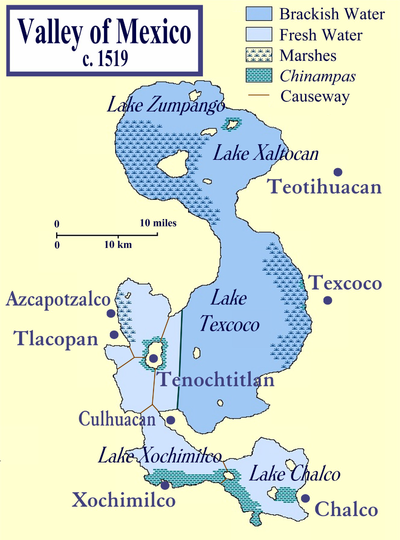 Lake Texcoco was the lowest-lying of all the lakes, and occupied the minimum elevation in the valley so that water ultimately drained towards it. The Valley of Mexico has been a closed basin since at least the Late Pliocene, and the lakes subsequently had no natural surface outflow, with the drainage basin forming an endorheic system. The lake basin is now occupied by Mexico City, the capital of the present-day nation of Mexico. Mexico City suffered from periodic floods; in 1604 the lake flooded the city with an even more severe flood following in 1607. Under the direction of Enrico Martínez a drain was built to control the level of the lake, but in 1629 another flood kept most of the city covered for five years. In that time it was debated whether to relocate the city, but the Spanish authorities decided to keep the current location. Eventually the lake was drained, by the channels and a tunnel to the Pánuco River, but even that could not stop floods, since by then most of the city was under the phreatic level. The flooding could not be completely controlled until the twentieth century. In 1967 construction of the Drenaje Profundo ("Deep Drainage System"), a network of several hundred kilometers of tunnels, at a depth between 30 and 250 metres (98 and 820 ft). The central tunnel has a diameter of 6.5 metres (21.3 ft) and carries rain water out of the basin. Good Morning. Could you please provide an update to the story "Mexico City is sinking! More gigantic earthcracks in Valley of Mexico", Posted by Chillymanjaro on July 22, 2011. I would like to know how far and wide it has spread. Also, which fault line is this particular part of the continent on? Which way(s) is the crack going? Thank You So Much. ~ Phyllis. Hey guys, I Live in an old mining town that has tunnels for miles in every direction and now we are having earthquakes often. Am I in danger?